 Kylvagn med bromskur typ NS "Fyffes Bananen"
Kylvagn med bromskur typ NS "Fyffes Bananen"
Denna produkt ger dig 294 bonuspoäng. Kylvagn med bromskur typ NS 'Fyffes Bananen', längd över buffertar 10,6 cm, epok II. Model: The car models a vertical board structure. The car has non-opening refrigeration area doors. Length over the buffers 10.6 cm / 4-3/16'. 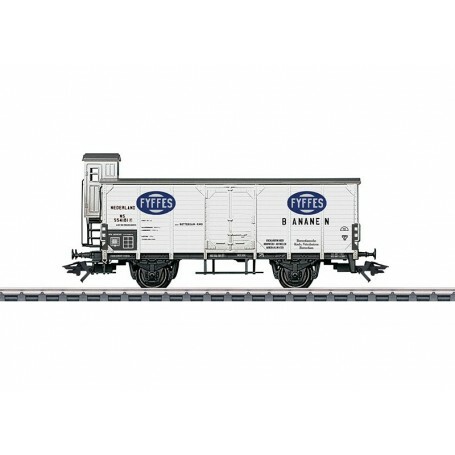 DC wheel set E700270. Prototype: Two-axle refrigerator car with a brakeman's cab. Privately owned car painted and lettered for 'Fyffes' Bananas, used on the Dutch State Railways (NS). The car looks as it did at the start of the Thirties.